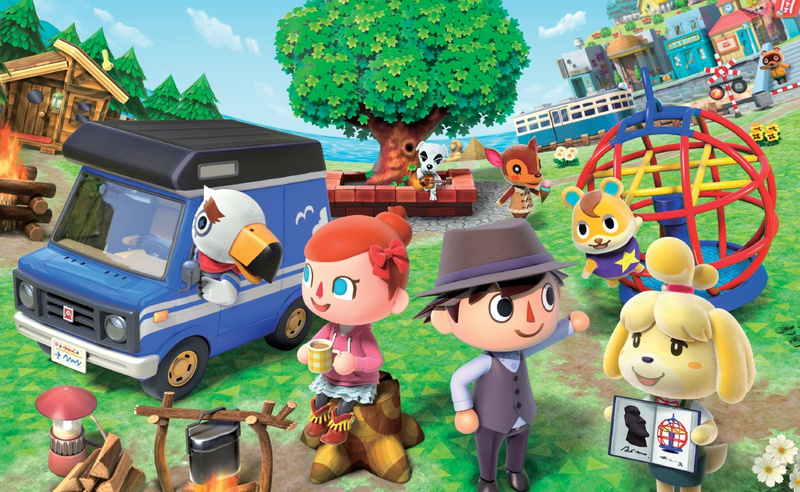 Animal Crossing: Wild World on the Nintendo DS is no longer the best-selling title in the lifestyle simulation series. Despite there being far less 3DS systems in the wild compared to the Nintendo DS, the odds have been defied. As of Nintendo’s latest financial report, Animal Crossing: New Leaf for 3DS has sold 11.78 million units worldwide - surpassing the 11.75 million total units sold for Animal Crossing: Wild World on the DS. This figure combines the original New Leaf sales and the updated 'Welcome amiibo' version. In terms of its overall success on the 3DS, New Leaf is the seventh highest-selling title on the device, with Mario Kart 7 at the top shifting a total of 17.21 million units. This illustrates just how popular the Animal Crossing series has become worldwide. It's easily one of Nintendo’s most successful modern IP. With sales like this, it’s only a matter of time until the next iteration of Animal Crossing is announced. Do you own Animal Crossing on the 3DS? Are you eagerly waiting for the next mainline entry in the series to arrive? Tell us below. Wait, so it wasn't already the best selling game in the franchise? All this time, I just kinda assumed that it was. I really don't get the popularity of the Animal Crossing series. Just seems to me like they're barely games. hopefully Animal Crossing on Switch approves fans that wanted it on the consoles. I'm glad to hear Wild World was that popular. Took NL a long time to surpass it. @SirFloof So as popular as the 3DS is, it's nothing compared to the phenomenon that was the DS. Everyone had one, and Animal Crossing was a popular pickup with the crowd that was persuaded to buy a "game boy" to play Brain Age and Nintendogs. Total DS sales are twice that of 3DS sales. 50 million more than the Wii. @Maulbert I don't care for it as much now, but the first was like social media for your household, before that was a thing. The never ending gameplay with real time, day/night cycles, and holiday events was areally neat new concept too. I'll be interested in one for Switch now that my kid will be old enough. Just don't reveal the Amiibo Festival sales. Those poor stores out there that STILL can't shift it even for a fiver. I would have bet the farm AC Switch would have been announced at e3. We. Got. NOTHING! Hurry up with this game!!! I’ve put almost 300 hours into New Leaf. If it had NES games built into it like the original on GameCube had (despite the fact that I own every single one in the original) it’d probably be more. Dang, I never thought Wild World's sales would be topped, but it finally happened. Glad to see New Leaf continuing to sell, I wonder if it will hit 12 million. @frogopus That's true, I was there for the DS craze. It always seemed to me that Animal Crossing as a franchise was more popular after New Leaf though, like how Fire Emblem became a mainstream franchise after Awakening. Maybe that's just me. @pullmyfinger that’s why gambling is so risky! @Maulbert It's kinda like having a chill vacation amongst friendly, adorable, animals where you spend your days doing various island activities like: catching bugs, fishing tournaments and festivals; but then the activities lead to a want (no, need) to decorate and customize everything, until you realize you've made your vacation place your home and you obsess over that one table or chair that could complete your bathroom. The cutsey, vibrant facade belies a much darker theme of obsessive capitalism and excess. @Antraxx777 No offense, but nothing you said there changes my mind. @Maulbert Fair enough. That was more a general message about what the appeal is to anyone that wasn't sure. My only concern is where they take the franchise on Switch. New Leaf is such a good game! Can they maintain the idyllic village lifestyle but make the game bigger? Maybe some sort of ‘Animal Crossing: Island Life’ where your village is an island amongst a larger archipelago? They could add tides or undersea exploration. Animal Crossing is like Sims but with animals? I am asking before I decide those games. Also are there games in the franchise to stay away from? @Zuljaras Stay away from amiibo Festival. Animal Crossing New Leaf 3DS = My Ritual every morning and every afternoon. I have 4 copies of the games ( 3 Physicals, 1 Digital download) and i still maintain my 4 different towns. 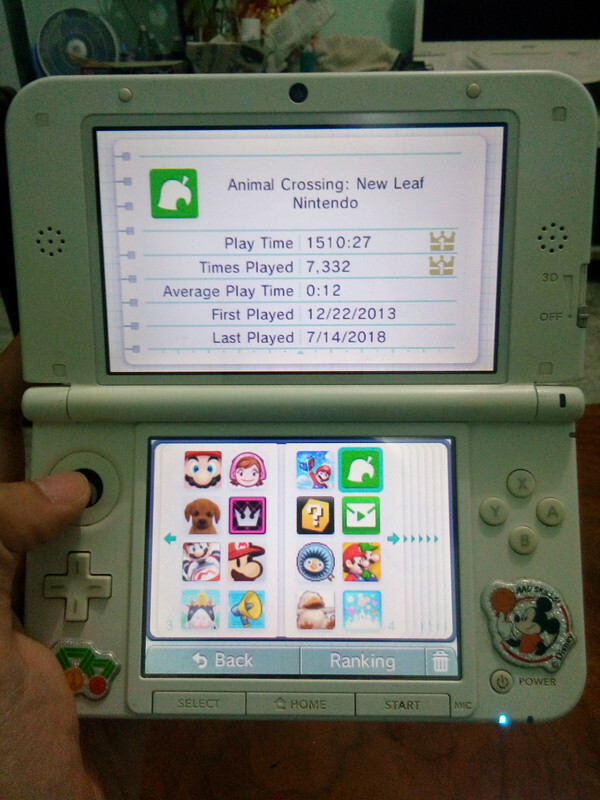 I have been playing Animal Crossing New Leaf 3DS for almost 5 years and still continue. Take a look my latest play time on my Older 3DS XL. Alright, that’s good to hear. So let’s get a new game for the Switch. @Anti-Matter Send that to the Guiness records. The only games I have such time in are World of Warcraft and Castlevania Symphony of the Night. I have been playing Dance Dance Revolution Arcade for Almost 15 (FIFTEEN) years, and i still play DDR until today (I play DDR Arcade every Sunday). I can spent until 2 hours for playing DDR every Sunday. It was one of my absolute favorite titles on the system and Animal Crossing is number one on my list of "not yet confirmed Switch titles". And beaten out only by Pokemon and Fire Emblem as my most wanted game on the system. Just imagine if they announce a new Animal Crossing, and it's for the 3DS. I don't think that the internet would survive such an event. Well, it's the seventh highest selling title on the 3DS. That isn't really so bad, is it? Wild World could be easily pirated (and was not available digitally otherwise) and was never available at a discount, so this comes as little surprise, really. "Just imagine if they announce a new Animal Crossing, and it's for the 3DS"
Animal Crossing New Leaf: Let's Go & Very Welcome Amiibo. I bought Wild World once. New Leaf three times. @Maulbert Funny, I thought the same thing then played New Leaf. Once I started I couldn't stop. I played every single day even if for 10 minutes, for a year and almost 3 months. It's insane how addicting it is. You feel like the whole experience is real if that makes any sense. That's all well and good but where is the next game?? I would really love an early 2019 release. Come on September direct! It's by far my most played 3DS game at nearly 500-hours. My wife bought a 2DS just so she could have her own copy of New Leaf. That's saying a lot because my wife is very much not a gamer. "It's by far my most played 3DS game"
I already did everything I can do in New Leaf, and I'm getting very tired of Pocket Camp on iOS. Here's hoping the Switch Animal Crossing is announced very soon. I want a proper game in the series. This sales milestone is especially impressive when you consider the fact that the 3DS has sold less than half of what the DS has sold i.e. 72 million units vs 154 million units. @Silly_G exactly. It took 3 New Leaf releases (original, Select, Welcome Amiibo) as well as a revitalization from the mobile app before it finally could surpass it. Oh, not to mention that the gap between games has been FAR longer than the just 3 years between Wild World and City Folk. @Fandabidozi that's the problem as well, these numbers are no doubt skewed because unlike the Switch version, you need multiple carts/downloads to have multiple towns. Switch won't need multiple carts, you can have like 8 accounts on the same system, so by Nintendo waiting like this, newcomers who got New Leaf after the Pocket Camp buzz, and decided they didn't like it would not get the Switch version- basically this means that Switch won't surpass its handheld predecessors for a multitude of reasons (primarily the multicart like Pokemon). I never got into any Animal Crossing other than the one on Gamecube. Not because the new ones were bad, but because I played the original on and off for 10+ years and it was just too hard for me to start from scratch after spending so much time there. @Maulbert I am right there with you, except that my wife has played every single game to death, she just loves Animal Crossing she is so mad that they have not brought a animal crossing switch yet. Easily my most played and favorite 3DS game of all-time! Good to hear. New Leaf is definitely the first true portable Animal Crossing experience and it deserves every right to be praised. I thought Wild World was a huge slap in the face for me (especially coming off of the far superior Game Cube game) for a plethora of reasons, but...I guess I'm glad it helped getting the series further off ground. @vanYth What if Animal Crossing tapped into the online service's NES games so you could access them from a console in AC. It could be a neat front end to access the catalog. You are severely overestimating the number of people who will buy a game multiple times. "Anyone else much prefer the quirky style of music from the first game to the rather generic music of New Leaf ?" They have their own CD covers as well. @Maulbert To each their own! It's definitely not a game for everyone. The best way to enjoy it is if you're looking for a relaxing, casual life simulator, otherwise you might just see it as a grind-fest.